You may have notices how Sweden’s export successes and leadership style are increasingly being singled out for praise in the international arena. One explanation may be the phenomenon of leadership the ‘lagom’ way. This is a less hierarchical way of leading an organization, where you involve your co-workers, support them and have faith in the whole team. Not laying down the law from the top down can take up a little extra time, but you gain new insights along the way. Not to mention the fact that you get your co-workers pulling in the same direction, whatever their area of responsibility. 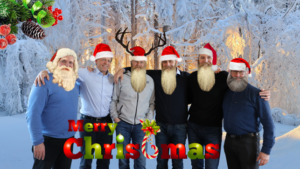 We got thinking about what Christmas lagom style would look like following the five principles of lagom outlined by Anders Richtnér, Associate Professor and CEO of SSE Executive Education (Full article here). Inclusion makes decisions more effective – nothing beats a handwritten Christmas list to make sure everybody gets what they want and even sweeter – make Christmas cookies together! Regardless of how you decide to spend your holidays, we thank you for your trust and your partnership throughout the last year and wish you happy holidays, good health, happiness and lots of success in the New Year.